Updated 1:15 p.m. | Posted 11:19 a.m.
A Phoenix developer on Tuesday unveiled a $225 million plan to rebuild St. Paul's riverfront. Don Cardon laid out his vision for the five-acre site where West Publishing stood for decades before moving out more than 20 years ago. The buildings there, including a former county jail, were finally demolished last month. 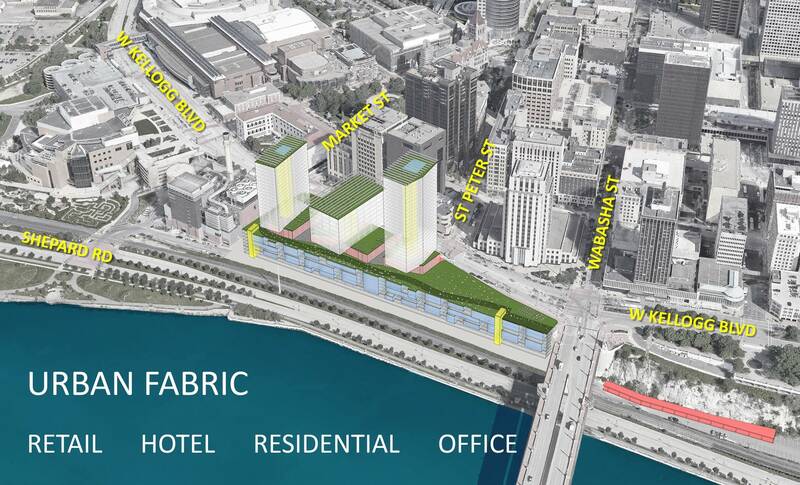 "This is going to be kind of a front door," Cardon said, of the project, which calls for 325 units of housing along with retail space running down Kellogg Boulevard, just west of the Wabasha Bridge, and as many as 1,200 parking stalls below street level. Renderings presented to Ramsey County Board members show three towers rising above the bluff, leaving views of the Mississippi River open on St. Peter and Market Streets, which run perpendicular to the river. Hotel giant Marriott is interested in the site, officials said. It isn't clear if or how the development would be connected to the downtown skyway system. But Cardon was confident about what he was laying out now. "The hospitality is going to smoke. It's going to do well," Cardon said, as he talked about dining opportunities, hotel branding and other elements. He said he expected the project would create 2,000 construction jobs and 1,100 long term jobs when it is finished. It's the latest in decades of efforts to reconfigure St. Paul's historic riverfront, sitting between two historic steamboat landings, hemmed in by the city's central business district and railroad tracks that run parallel to the river. The biggest hurdle, though, was a series of buildings dating back to the 19th century, built into the river bluff. Demolition was a daunting prospect and proved an insurmountable obstacle for private redevelopment. Ramsey County ultimately decided to remove its own operations from the existing buildings, tear down the structures and built a retaining wall that will make the site suitable for new construction. "We're up to $16 million to get this shovel ready," said county commissioner Jim McDonough. The project will fill in a key gap in St. Paul's riverfront, running from the Science Museum of Minnesota, to the newly renovated Union Depot downstream. "It's ready now," said Ramsey County Board Chair Victoria Reinhardt. "I think it's going to be exciting for this community. There's a lot going on in downtown St. Paul and this will add to that." Heather Worthington, Ramsey County's deputy manager, said county staff are planning to negotiate a master development agreement with the Cardon Development Group this summer, mapping out the next three years of work on the site and financial arrangements. Cardon is also planning to bring in local partners on the deal, including HGA Architects. Correction (April 18, 2017): An earlier version of this story reported an official saying the project would have as many as 2,000 parking stalls. The county now says it will be as many as 1,200.